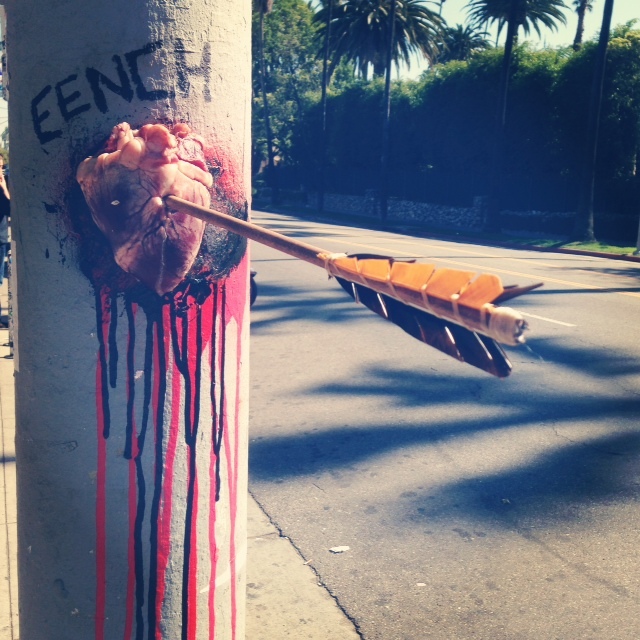 On Valentine’s Day, my husband went to work and stumbled on this street art piece: an arrow shot through the heart. Bright red, black, and bruised up against the telephone pole. I love the realism of the heart– is it real? A pig’s heart? Imitation? I’m not sure. I was not there in person to discover it. I was at home– sick with a bad upper respiratory infection. I think, when I was younger, this would have really bummed me out– being sick on Valentine’s Day, like I’m supposed to look hot and be on some spicy dumb date, wearing a push up bra or whatever. Now, I don’t feel that way. I don’t feel any particular way about it all. When my husband showed me the photo, I thought it was really funny and comparable to exactly what I was thinking– how Valentine’s Day sometimes feels like one big societal farce or fodder for romantic comedies. Then . . . something changed in how I saw this piece. I started to think of the Armenian Holocaust and all the other deeper darker ways our hearts get torn as we grow into the world. I don’t necessarily feel like this is the intention of the work, but, the translation made me pause and consider how, according to lore, cupid has two types of arrows. When we are hit by a golden arrow, we are filled with desire. When we are hit by a lead arrow, we are filled with aversion. Cupid is not always a good samaritan. I love this piece (above) because it acknowledges the complexities and largeness of love in a full bodied (sometimes melancholy / sometimes mystical) way. Yes and a reminder to be careful what we wish for!